A quick google search of "How to Stop Eviction" returns 16,200,000 results. With the internet housing tenants now have more resources than ever to find loopholes in an effort to thwart an honest Landlord’s attempts for eviction and collection of back rent and damages. Now more than ever Landlords and Property Managers need sound training and legal advice to stay ahead of changing laws and evil-minded tenants. Professional Tenants are those who know how to work the system to their advantage in order to hide from the law, prevent garnishment by quitting their job, and coerce unknowing Landlords into settlements and threats of counter-suits. CREIANC invites all Landlords, Contractors and Real Estate Investors to attend this special educational training covering How To Avoid Landlord-Tenant Litigation in Buncombe County. 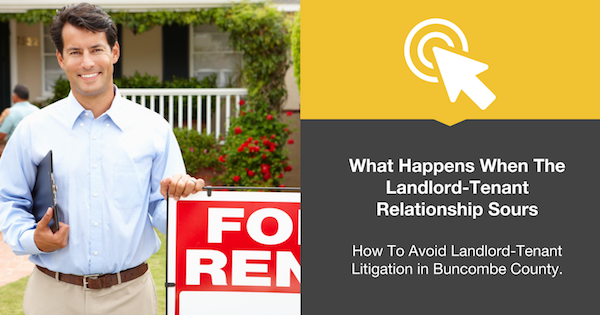 A panel will discuss and answer your questions about the ins and outs of the landlord-tenant relationship and what happens when that relationship sours. When you attend this event you will also learn ho to Increase Your Landlord Skills, Increase Profits, and Reduce Stress! The panel will include Buncombe County Magistrate Joseph Knight. Mr. Knight is the primary civil small claims magistrate in Buncombe County. As such, Mr. Knight hears thousands of landlord-tenant cases each year and knows the common mistakes that both landlords and tenants make in filing their paperwork and representing themselves in small claims court. Mr. Knight will give his view from the bench of the common misperceptions litigants have and common missteps litigants make in breach of lease cases and summary ejectment matters. Joining Mr. Knight on the panel will be Ben Many of Pisgah Legal Services. Mr. Many is an attorney and advocate in Pisgah Legal’s Housing Rights Section. Mr. Many will speak on the mistakes that many landlords make in failing to keep their properties habitable and in good condition, and on the mistakes he regularly sees landlords make when going to court. He will address the ideal that Pisgah Legal is there to prevent landlord abuses and protect the rights of unknowing and unsuspecting tenants, and not just to make lives difficult for well-educated and responsible landlords. Rounding out the panel will be attorney Kenneth Hunt of the Roberts and Stevens Law Firm in Asheville. A lawyer representing the Asheville Housing Authority, Mr. Hunt will be presenting the landlord’s perspective of the landlord-tenant relationship. From making sure the initial demand letter is right to filling out the proper small claims form, Mr. Hunt will walk members through the steps from breach to successful eviction, including what to do with all that stuff the tenant leaves behind. Mr. Hunt regularly litigates on behalf of landlords against tenants often represented by Pisgah Legal Services. Whether you are just starting out in real estate investing, or are working on your hundredth deal, the Carolina Real Estate Investors Association (CREIA) can help you learn more, make more, and have more fun doing it. The CREIA on Event Monday March 12th is hosted by some of the top investors and real estate business owners in the country guarantees you can hone and sharpen your deal analysis skills, examine common mistakes and pitfalls. And then network and learn from others in your own area and at your current level in real estate: beginner, or pro.